At times when I need a reminder of how beautiful Dressage can be, I look primarily to my library. No book cheers me more than The World of Dressage, by Neil ffrench Blake. I stumbled upon this book at a thrift store, twenty years ago, and a better dollar was never spent! 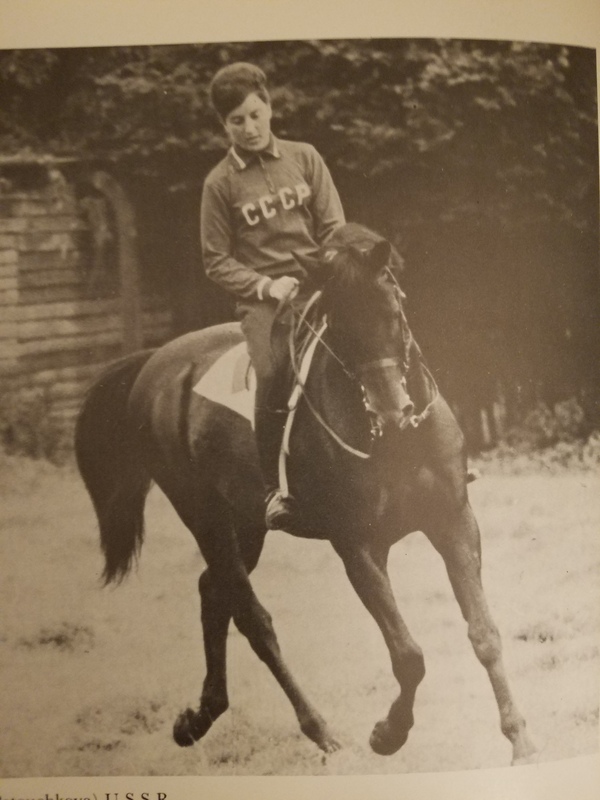 Published in 1969, it is filled with black and white photos of top riders of the era, from all of the Olympic disciplines. It is a beautiful tribute to a time when tack was simple and the horse was paramount. Most fun of all is that the author freely makes comparisons and criticisms, in the name of educating the reader. As I recently leafed through the book, I decided to share some of my favorite photos and commentary. One of my favorite things about this book is that the photo captions always list the horse first. 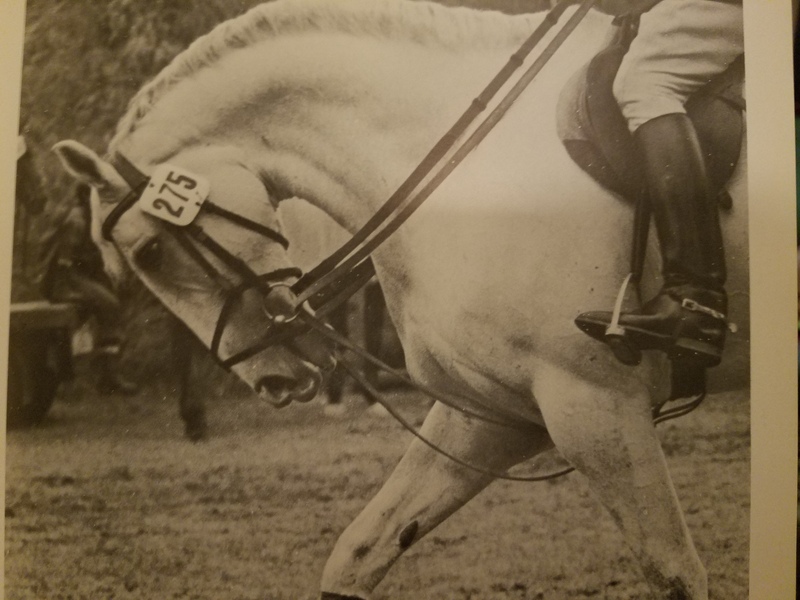 In some captions, the horse’s name is followed by the rider and country, and sometimes just the country. This is a consistent and clear choice by the author, and I love how it places the emphasis where I believe most of those riders would have wanted it. So, in that spirit, I will caption the photos just as the author did. “A few minutes in a dressage arena watched by a small party of highly critical judges, can represent many thousands of hours of hard work. 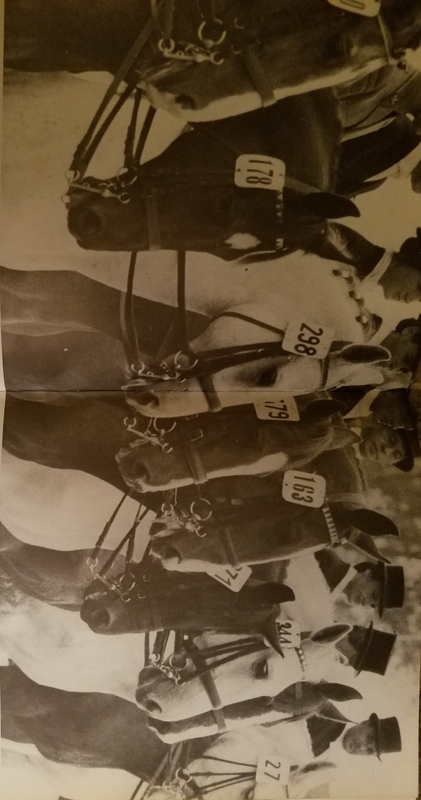 The observer can often gain a greater insight into the principles of horsemanship by watching experts in training, as opposed to actually performing (which is why so many photographs in this book were taken while riders were practising). I could not agree more! I have learned far more by watching the warm-up arena (and lessons) than by watching competition rides. He clearly likes this latter pair, as they seem to be featured more than any other horse/rider combination. The photos of Pepel and Elena seem to always embody the lightness and balance, in both horse and rider, that is the ultimate goal of Dressage. The author uses them as good examples several times, as with this next passage. It is the “angle” that appears about one third of the way down Gladstone’s neck that the author is referring to as ‘broken neck’ (also said to be ‘broken’ at the third or fourth vertebrae). His description of what causes it is quite accurate, although in this picture the horse is nicely up and open in his carriage (however, there is a feeling of retraction, rather than reaching, with the neck). Still, the benefit of proper development can be clearly seen in the example of Pepel that he refers to above (seen here at left). Note the more even arc to the neck. To be fair, Gladstone appears to be a Thoroughbred – the favorite mount of (particularly U.S.) Eventing riders of the day. Likely he was raced in his early life, and I have seen horses come off the track with that area of their neck over developed. Although improvable, it is nearly impossible to reverse such damage. 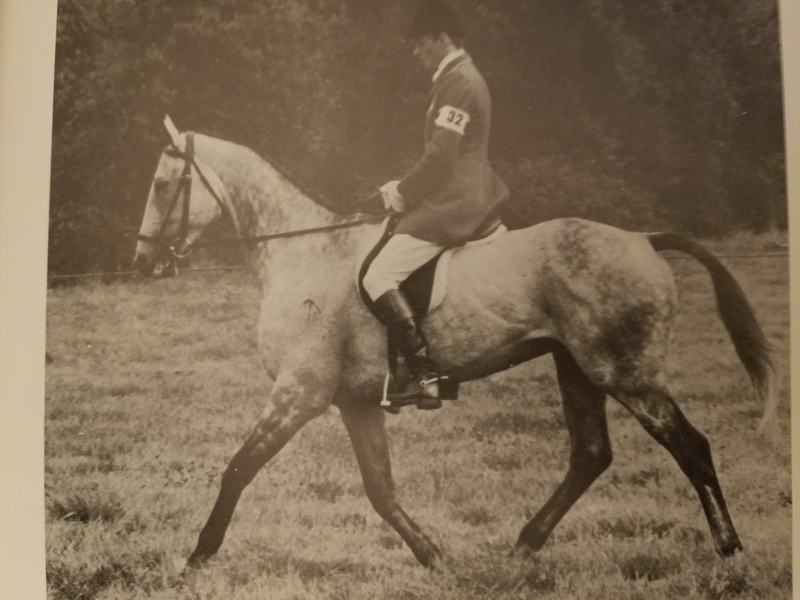 Still, it is an affliction seen all too frequently in the Dressage world, today, where necks such as Pepel’s are all but unseen – even on the top horses in the world. 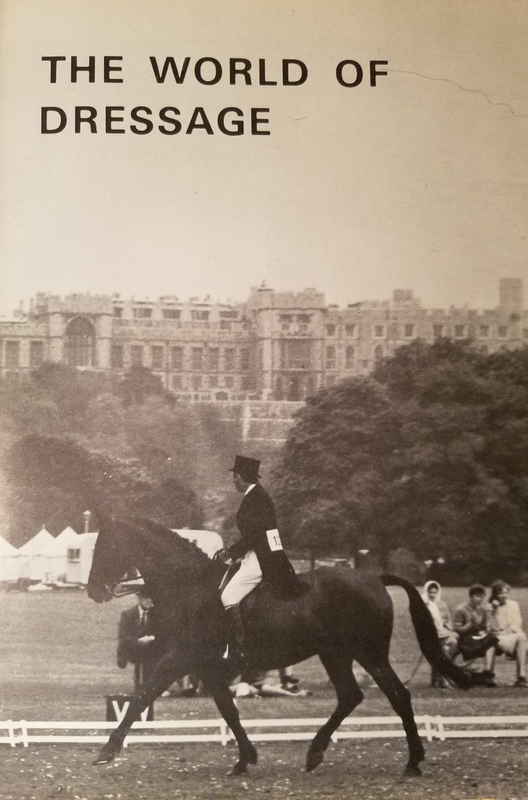 That is what I love about this book – it is a catalog of lovely images from a time when you could find light, lovely riding done in partnership. Development of horse and rider took time, and the results reflected that. Take the picture of Pepel, above – he is actually executing a rein back in that photo. When was the last time that you saw a rein back done, in a Dressage arena, with such lightness of rein, and such regular steps? I will try to share other gems from this book, in future posts; but, for now, I want to leave you with my favorite photo from it. When have you last seen such an array of relaxed, yet attentive, horses standing in such close proximity? Reins are held lightly. Eyes are all soft. There is both peace and readiness in this photo. 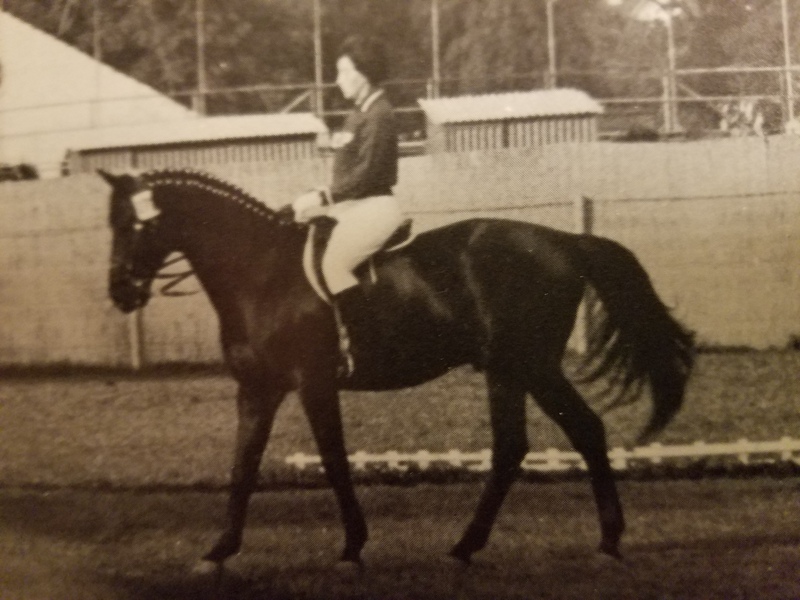 This, for me, is what Dressage horses should look like – not the overly sweaty, overly tense, often stressed out horses that we see all too often today. This entry was posted in Classical Training and Philosophy, My Journey and tagged artificial aids, correct development, Elena Petouchkova, Gladstone, Horse training, Michael Phelps, Neil ffrench Blake, Pepel, The World of Dressage. Bookmark the permalink. Thank you, Fran! I bought the book for the novelty of the old photos, and was thrilled when I first read it. Not sure when open and honest critique fell out of fashion … but it certainly seems to have! I will definitely look up this book and add it to my library! It may be hard to find, but is worth it! I’ll keep an eye on eBay and hopefully it will come along! I have also been lucky to find some out of print from used book sellers on Amazon. Good luck!